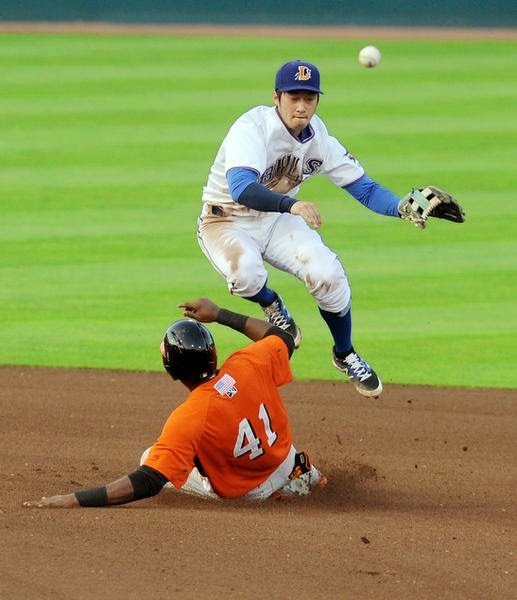 Hak-Ju Lee turns a double play over Norfolk’s Francisco Peguero. Saturday, June 7, 2014. Matt Andriese had a great day, while the quirky inning of the game was the Bulls 8th where they scored 2 runs without getting a ball out of the infield (3 errors by Norfolk). A pretty decent home stand, the longest of the year. Now the Bulls are off for their longest road trip of the year, 2 games in Norfolk and four each in Indianapolis and Louisville, followed by a day off. So we won’t be back to the DBAP for almost two weeks. Maybe, just maybe, the turf will get a chance to recover. If it seems like I’m avoided talking about yesterday, I am. Nate Karnes, acquired by the Rays as part of what seems like an aggressive approach to unloading competent catchers (Lobaton to Nationals in this case, but see also Giminez, Vogt, Navarro, Jaso, Albernaz, Rodriguez, Chirinos, Ashley), has actually been doing much better than his stats indicate. Four out of his last six games have been well-pitched no-decisions. But yesterday was awful. Then Brulio Lara made it very much worse with a 4 walk, 4 run, 2/3 of an inning. I know that’s hard to do. Here’s how. You come into the game and strike out the first batter. Then you walk the next two. Get the third batter to fly out. Then walk the next two, bringing in a run. You leave the game with the bases loaded and your replacement (Doug Mathis) gives up a bases-clearing, 3-run double. That gave Lara an ERA for the game of 54.00! About Mr. Lara: Nothing in his performance to date says that he is ready to pitch at Triple A level. Any talented left-hander will get his shot, but in 9 appearances, Lara has given up a run per inning pitched, has more walks than K’s (12 to 10) and has 3 losses and a blown save. He’s been with the Bulls for almost a month now. Seems like it’s time for the Rays to consider he get some more time at a different level. Doug Mathis is back from his Bulls-pitcher-in-waiting position (last appearance May 27). I can’t imagine how he keeps himself in condition to play, but he’s done OK (not counting the three runners he inherited and let score yesterday) and has been a help to the Bulls. I take back critical things I’ve been thinking, and maybe saying, about him. Hitters? Cold, cold, cold although Jayson Nix did hit a homer in the 9th. In fact — game trivia alert — he got 7 of the Bulls 11 total bases last night. More background on Kirby Yates. The Rays would have done well to give him a shot last night. Instead, they went with Grant Balfour who gave up a bunch of runs to lose the game against the Mariners in the 9th. The Hak-Ju Lee photo from Saturday’s game certainly shows that he is back to form on the field. I am contually amazed at an athlete’s selective amnesia. Ordinary human beings would likely never put themselves back into situations that led to a year’s worth of trial and pain. But there he is. "selective amnesia" - nice turn of phrase.